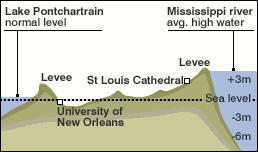 It’s too easy, not to mention slightly vindictive, to blame all of hurricane Katrina’s catastrophic impact and aftermath on the Army Corps of Engineers; but it is worth remembering that New Orleans – in fact the near totality of the lower Mississippi delta – is a manmade landscape that has become, over the last century at least, something of a military artifact. To say that New Orleans is, today, under martial law, is therefore almost redundant: its very landscape, for at least the last century, has never been under anything *but* martial law. The lower Mississippi delta is literally nothing less than landscape design by army hydrologists. 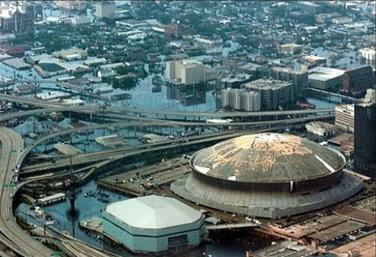 New Orleans as military hydrology. Or, military urbanism as a hydrological project. When even people within the Army Corps of Engineers began to warn that the hubristic landscape design methods of the US military might actually be inappropriate for what is a very muscular, flood-prone, not-to-be-fucked-with drainage basin, the warnings were taken – well, frankly, they were probably taken to be blatantly unpatriotic, knowing what’s happened to this country. But I digress. But pumping the flooded city dry will be a “hard task,” according to the somewhat characteristic understatement of the BBC, in an article that then outlines the various steps of the engineering strategy involved (included new causeways, steel sheets, and 300-lb. sandbags). But even if New Orleans is “pumped dry,” even if the city is eventually drained, even if commerce returns and the Big Easy’s population goes back to life as usual, there is still a much larger problem to face. Artificial barrier islands; 200,000 cubic feet of water each second; two new deltas: if at first you don’t succeed… try ever more elaborate feats of hydrological engineering. More of the disease is the cure for the disease. (See here for a much older – yet no less impressive for being small-scale – example of complex hydrological engineering). 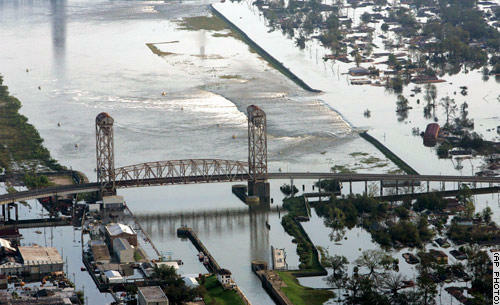 Katrina, in this context, becomes a problem of landscape design. 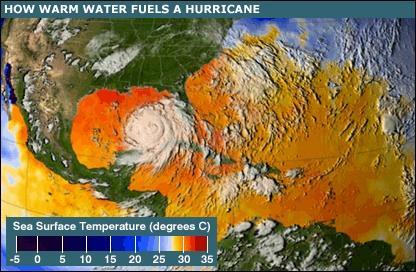 The “hurricane” as an atmospherically-interactive, military-hydrological landscape problem. It’s a question, in other words, of human geotechnical constructions and how they interact with the complex dynamics of the earth’s tropical atmosphere and waterways. So what may soon become known as the destruction of New Orleans was simply the violent and undeniable clarification of how bad certain examples of landscape architecture really can be. This should surprise no one – horrify everyone, but surprise no one. Financially, could things have been different? 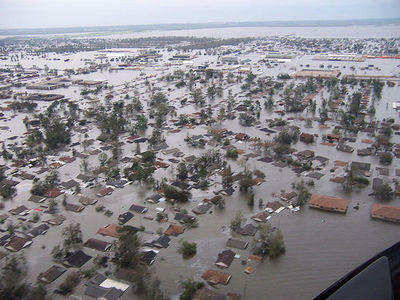 Could the money now being spent in Iraq and on bogus Homeland Security projects have gone elsewhere – into FEMA, for instance, or into hydrologically better-designed levee projects on the outskirts of New Orleans? Or into some of those “artificial barrier islands” mentioned above (that BLDGBLOG would love to help design)? Yes, the money could have been spent differently. But is further entrenching a particular manmade landscape – really, a kind of prosthetic earth’s surface, a concrete shell, of valves, dams, locks, levees, and holding ponds installed upon the lower Mississippi – really the answer? Perhaps; but equally possible is that *there should not be a city there*. 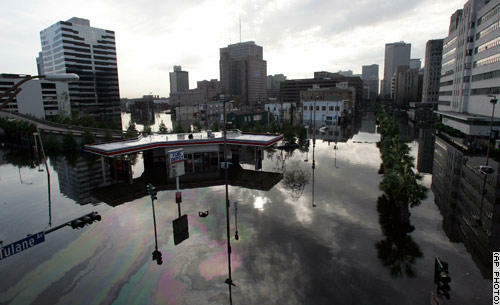 It becomes, that is, a flooded city. 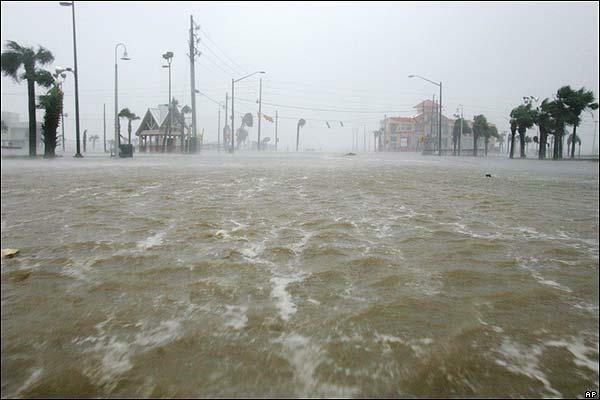 This thread continues in Katrina 2: New Atlantis (on flooded cities); and Katrina 3: Two anti-hurricane projects (on landscape climatology) – both on BLDGBLOG.